-Se compra por Dulce de Halloweenx150 a Fondón (Horda) o Dorothy (Alianza). -Solo durante el evento de Halloween. I would not be surprised if it possessed some phasing and/or levitation, though that would be consistent with both an ethereal (i.e. "the Departed") and superhuman Kitty Pryde. "Oh gosh, oh golly! Oh wow!" New Hallow's End reward, costs 150 Dulce de Halloween as of beta build 18716. Does anyone know if this will be available this year? I assume so but it's always best to check. Can be bought from the same vendor that sells the 3 other pets (Calabacino siniestro , Familiar felino, Gato birmano maldito) And Hombre de mimbre pequeño for toy box. Each cost 150 Dulce de Halloween. The German name of this pet is "Shroedingers Cat"
Along with the other one, Cursed birman. If you collect all of the bucket candy from pandaria & outland/Kalidimor/eastern kingdoms AND northrend you should have enough to obtain both of these feline's this hallows end. Interestingly, in the German version, this has been renamed to Schrödinger's Cat. Fun fact courtesy of Perculia. I suspect this is named for Ookla. A speed test app named after the namesake cat who passed away (born 8.8.97 - died 13.1.13). my favourite pet in game after i got him yesterday. Anyone else get a serious pet cemetery vibe from these? 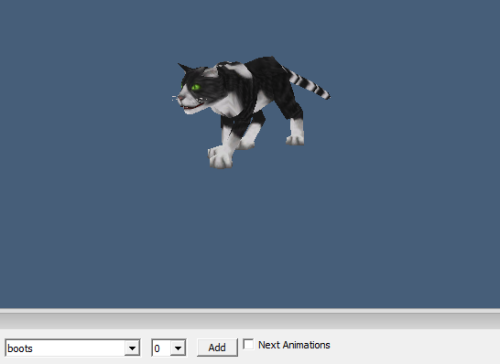 I wonder if it is modeled after a late pet of one of the devs. The description reads: "Not even death would stop this kitten's insatiable curiosity." If the link doesn't work, then I apologize. There is a thread on warcraftpets forums about unused cat fur textures if anyone is interested. Its a black and white cat with a large splotch of white on the back, white "boots" up the legs and the tail is white with black rings. In my achievement window it does not appear as counting toward the Crazy Cat Lady achievement. You can get both the new pets Widget the Departed and Cursed Birman by doing candy buckets on two characters. I got them on the 18th and then leveled them and my Feline Familiar up to create the Hallo(ween) Kitties Team. The cats are great on their own, but together they have quite a neat synergy because of Call Darkness. Check out Widget and the team in action here if you want a closer look at the synergies of their abilities. They say curiosity killed the cat. This one decided curiosity wouldn't stop it. A friend of my mother's had a cat that I was particularly fond of named Widget who passed away within the last few years. Now I can't see this pet without feeling a little sad each time as I remember him. Gato birmano maldito and Cachivache el Difunto, still not added to the achievement Los gatos son mi vida. If Blizzard do so, the achievement will be done much more easily. This command also works to these two "cat" pets. One of my favorite cats was named Widget. I had him 14 years and he passed a few years ago. I just got this pet and it's made me teary eyed. RIP Widget. I hope your drowning in catnip on the other side of the rainbow bridge.